The Asheville Art Museum is excited to host an opening reception for two exhibitions Sunday, March 16 from 3:00 to 5:00 p.m. Both Pierre Daura: Modernist in the Mountains and Take 10: Collectors’ Circle 10th Anniversary are on view beginning Saturday, March 15. Pierre Daura: Modernist in the Mountains features the beautiful artwork of artist Pierre Daura, including many mountain landscapes – scenes that residents of Western North Carolina will feel connected to. In 1998, the Museum received a gift of 36 paintings by Pierre Daura, given by the artist’s daughter Martha R. Daura, and the Museum is thrilled to be showing some of the works. Pedro Francisco Daura y Garcia (1896-1976) was born in Minorca, Spain and raised in Barcelona. He studied in Paris and in later years spent his summers in France. But from 1939 until his death in 1976, he lived in the Shenandoah Valley near Lexington, Virginia. 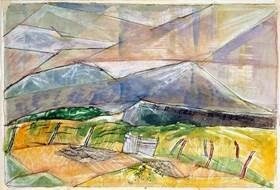 The paintings the Museum selected focus on his work done in the Blue Ridge Mountains and the Shenandoah Valley. Daura’s paintings from this region often depict sites and scenes from life near his home. In some images, he works in an Impressionist style while in others he utilizes a Cubistic approach. His reflective character is evident in these analytic and exuberant paintings. As a young man, Daura studied in Barcelona at the School of Fine Arts with Pablo Picasso’s father, Jose Ruiz Blasco. In 1910, at the age of 14, he rented a studio with fellow artists and sold work in his first exhibition. At the age of 18, he went to Paris with a letter of introduction from his godfather, cellist Pablo Casals. Daura exhibited at the Salon d’Automne in 1922 and 1926. His rejection from the Salon in 1928 was a catalyst for joining other artists such as Jean Helion, Ernest Engel-Rozier, Alfred Aberdam and Joaquin Torres-Garcia in a highly acclaimed exhibition entitled Cinq peintres refuses par le jury du Salon at the Galerie Marck. It was during this time that Daura met and married an American art student, Louise Blair. In the mid-1930s, Daura made his first trip to Virginia to visit his wife’s family. In 1937, he joined the Republican army in Spain as a volunteer fighting against the forces of Franco. He served and was wounded at the battle of Teruel and went to France to recuperate. Refusing to return to Spain after the war, the family stayed in France until 1939, when World War II prompted their move to Virginia. For the remainder of his life, Daura lived in Rockbridge Baths near Lexington. Daura was active as an artist and teacher. He taught at Lynchburg College and Randolph Macon Woman’s College. Take 10: Collectors’ Circle 10th Anniversary celebrates the generosity of the Asheville Art Museum’s Collectors’ Circle, a membership group that encourages the exchange of ideas and interests, art learning, connoisseurship and collecting. As a vibrant and critical source of support, they are dedicated to growing the Museum’s Permanent Collection through annual gifts of artwork, selected and presented in partnership with the curatorial staff. The Collectors’ Circle also supports the long-term growth of the Museum’s acquisition funds to strategically purchase art. The Circle promotes the Museum’s mission to collect, preserve and interpret American art of the 20th and 21st centuries. This exhibition presents a wide variety of gifts to the Museum by this dynamic group and includes works of art from the Circles’ first 10 years. Take 10 is on view in the Museum’s Holden Community Gallery, which is always free and open to the public.